The chilly weather has officially arrived and with that comes all colors and prints of blanket scarves. Today I've incorporated my favorite new blanket scarf (only $13 from Forever 21!) with one of the biggest colors of the season -- grey! This color has a reputation for being dreary but in the winter months, it can be a lighter option from go-to black option. I don't know about you all, but black seems to overflow in my outfit rotation once the winter months roll in. Grey is a great option when you need a break from the black -- or if you just need to brighten your outfit mood a bit ;). I hope you all have had a great holiday week so far! It's hard to believe that tomorrow is Thanksgiving day. I'm excited to spend some quality time with family followed by some Christmas decorating! Do you all have anything extra fun planned? I would love to hear! 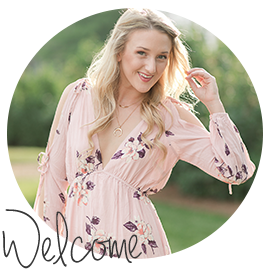 Thank you for stopping by my little creative corner here at Chic + Shimmer! I'm so thankful for you all. Kathryn, such a pretty outfit! Those booties are adorable and I love the overall color palette! Thank you for sharing and have a wonderful Thanksgiving! Thank you Lauren! You're so sweet. I hope you have a wonderful Thanksgiving as well!